MainLobby Server 4 is a Server side application written for MainLobby and other Cinemar software. It is the glue that ties together multiple MainLobby Client PCs, tablets, automation and media hardware and software together with bi-directional communication. 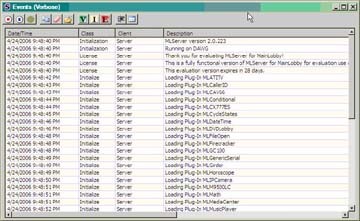 MLServer 4 multiple resizable windows to allow for easy configuration and programming of the server features. Powerful on-event, timed and conditional processing has been added with MLServer 4 so you can easily build complex automation into your home. 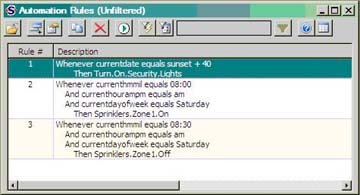 Turn a light on at dusk by building a rule in MLServer from it's drop down choices. 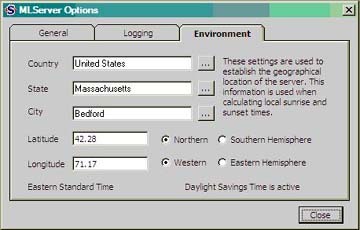 Let MLServer calculate "dusk" for your locality by setting up the new Environment configuration. One of the most important features of MLServer 4 is the ability to support software drivers that tie together 3rd party hardware and software commonly used in home automation and media control. View this growing list of MLServer 4 drivers. New with MLServer 4 is a drivers and applications management view that makes it very simple to add, configure and manage the software. Drivers and Apps provide the flexibility to allow your system to grow with changing needs. For ease of monitoring the system, MLServer 4 includes an Event window that allows for system monitoring. Logging can be set to view only Errors, Informational only or Verbose levels of detail. MLServer 4 has been completely rewritten in .NET 4 to increase reliability, ease of management, and faster processing of commands. Command and image processing has moved from the MainLobby Client to MLServer 4 to further reduce the CPU needs of the client and to speed up the system communication. This significantly decreases the cost of client PC hardware and total cost of ownership for a multi client automation system. MainLobby Server 4 was designed with flexibility in mind. Most installations requires just one "Primary" MLServer 4 application installed on one PC. All MainLobby 4 Clients and Web applications connect to this Primary MLServer. MLServer then brokers all communications from Client to Hardware and Client to Client. MainLobby Server 4 comes licensed for up to 5 concurrant connected Clients. For larger installations, additional MLServer 4 connection licenses can be purchased in groups of 5. Read theMLServer Help document for more details. License and PC Activation code provided with purchase.